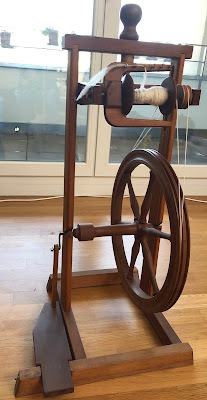 A little while ago I was gifted a spinning and natural dyeing lesson with a lady called Sian that lives near my in-laws in Spain. It was a fantastic course but I didn't do much with what I'd been taught because I was concentrating on my City and Guilds and was trying really hard to not get distracted. The first I picked up at the brocki for 30chf - I believe it's from the canton of Ticino and is probably 100+ years old. I've got it to sort of work - the flyer didn't seem to have an orifice, so I got one drilled and am now trying to figure out a brake as it works by Irish tension. 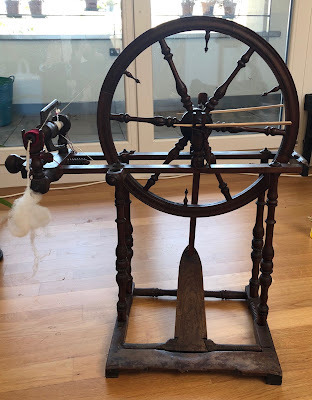 I've managed to spin a very little, but I need more time playing with it. The second I got through ebay for not much more but found that when I got it home it didn't have a whorl (it's double drive). It's a Swiss vertical frame. One was made for me and a couple of extra bobbins and I've got it to work. So far, I'm not making the most consistent yarn, but I'm sure with more miles under my belt it'll get better. I've also been spinning a bag of carded lambs wool which I was gifted years ago, and I have no idea of its quality, so that's probably not helping either. The other part of the course I did with Sian was natural dyeing. This was also great fun and I've been wanting to have another go at this nearly as much as I've been wanting to get going with spinning. With her I dyed using coccineal and also yellow and brown onion skins. Since I've been having a go myself I've tried dyeing with dandelions as there's lots around at the moment. From left to right: Coccineal, brown onion skins mordanted with alum, brown onion skins un-mordanted, yellow onion skins mordanted with alum, undyed, dandelion mordanted with alum. I'm not entirely sure which types of fleece were used for each, but I know we spun Lojena (a local breed of Spanish sheep), ryeland, merino, some fleece from a neighbour of an unknown breed and some herdwick which I'd brought with me (the dark brown in the undyed skein above). It's a fascinating process and I'm looking forward to doing some more. I have planted some woad seeds and have my eye on some elderberry trees to pick some berries from later in the season. I have to figure out something to knit from my test skeins - I'm thinking probably a cushion cover. 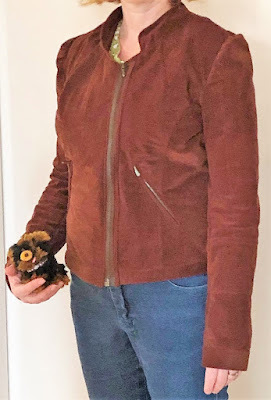 Back in 2015 (apparently) I started to repurpose a faux suede jacket I'd made and didn't wear. I decided to try to make it into a the Burda silk motorcycle jacket. I often like the look of Burda patterns and then regret getting them as I hate tracing and adding seam allowances and then the directions tend not to be as clear as I would like. Anyway, 4 years later and I've finished it. F insisted that her pom pom pet, Freya, wanted to be in the photos too! 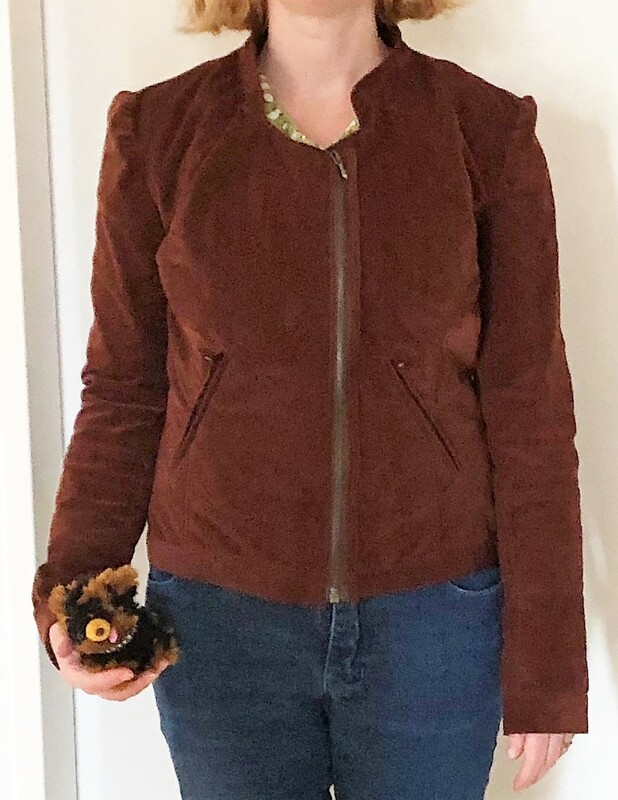 It's not perfect, but I think I'm more likely to wear it than the boxy jacket it used to be. The sleeves feel a little tight when I'm putting it on - maybe I should have made the next size up - but I doubt I would have had enough fabric for that looking at the meagre amounts I have left. Most people work at a desk, not me - I do most things (apart from sitting at my sewing machine or somewhere knitting) at my ironing board. I'm making a blouse for F from some spotty purple fabric using the Oliver and S music class blouse and skirt pattern. I've made the skirt a couple of times before, but never the blouse - I'm making the size 10, have added a couple of inches to the length and intend to sew some shirring elastic around the sleeves on Fs request after her seeing that on a top I made for myself. There's also a yarn label for Creative Bubble by Rico Design. I had one ball of this to try making washing up tribbles from, it was successful so the yarn label is around as I went looking for some more. Next is my Geo Yoked Fair Isle Sweater by Di Gilpin. I received the pattern and yarn for this from D for my birthday last year after seeing it (and trying it on) at Di Gilpin's stand at Yarndale. It's in a bag as I'm having to pause as I have run out of the main colour - I don't need a lot more as it's mostly just the yoke to do, and Di has been very helpful in finding another ball for me, so hopefully it won't be in the bag for long. In the red folder is the paperwork for the first assessment piece I submitted to City and Guilds and which I intend to work into a publishable pattern. 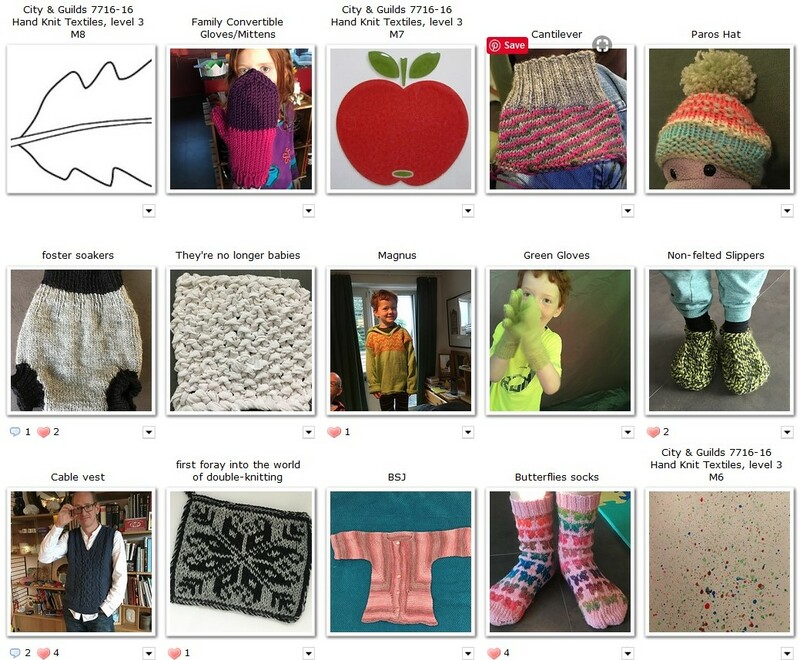 At the moment I'm rewriting the charts from excel into Stitchmastery before I get the pattern into shape and then look for a couple of test knitters. I'm off to the Swiss Yarn Festival tomorrow - I wonder if I'll find any goodies. Thirty five, actually, and there's two completed items (a jumper and a cardigan) that aren't on here as I haven't taken a post blocking picture to put on Ravelry yet. 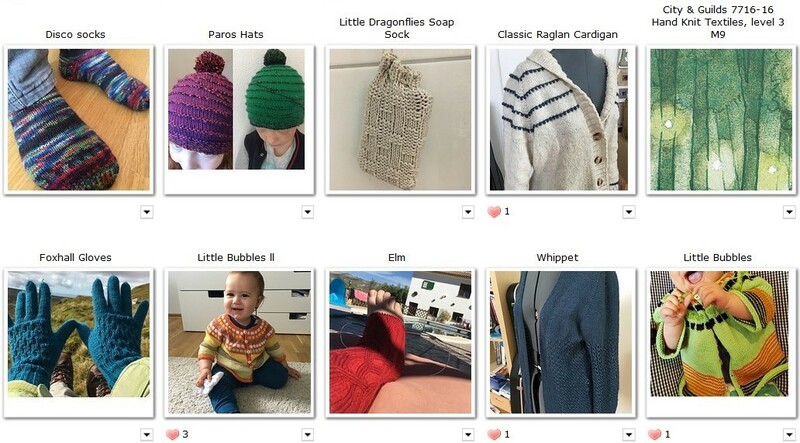 Seven of these projects are all related to one larger project that I've finally finished - and that's the City & Guilds level 3 in knitwear design. It's taken me a while - I was pretty slow at first, but managed to speed up and concentrate on it so that I was able to finish it within the designated C&G time frame. I've learnt a lot during the course - knitting techniques, art techniques, design process, knitting confidence - all sorts of things. 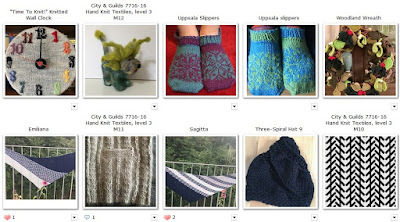 Four of the modules had knitted assessment pieces associated with them, so my plan now is to try to publish those four items (seat cushion, summer top, shawl and cardigan). 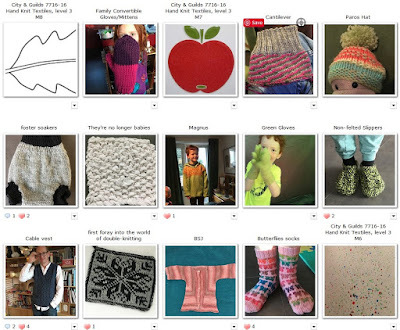 I'll start by self publishing through Ravelry, just to get a feel for the process and then go from there. I'm keen to do this, but am also keen to preserve knitting as a hobby, rather than getting too bogged down in deadlines and stress. The beginning of 2019 has been jam full of finishing off some really large projects that have been on the go for longer than my blog hiatus (I thought we agreed we weren't going to mention that), and as I originally set up this blog in order to track my progress and keep me a little accountable to myself - here I am again! 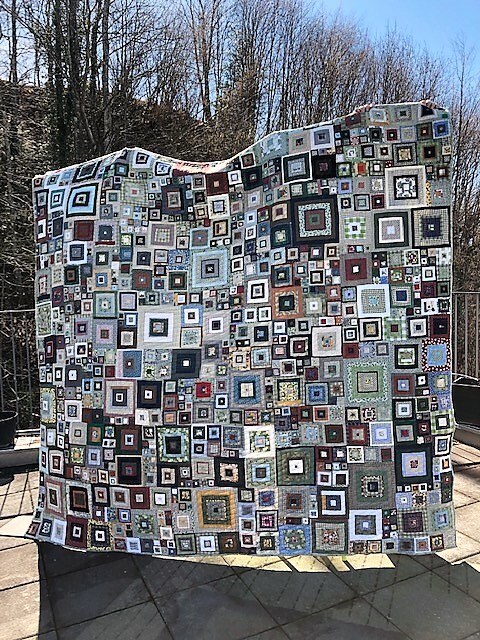 The first project that I'm going to blog about that finally got finished this year is my ten year quilt project - wowsers, that was a long 10 years! It had a number of stalls and also moved house a number of times (9 house moves in total and between 5 countries! ), so I'm really pleased to finally be able to call it finished and have it on the bed. Here it is being held up by my three trusty helpers. I quilted it on my home machine using techniques from the book Walk: Mastering Machine Quilting With Your Walking Foot by Jacquie Gering. I found this a really useful book, and although the quilt is huge (220cm x 240cm ) I managed to do it on my machine. "It is astonishing how long it takes to finish something you are not working on"
As you can see from the picture, the back drifted a bit when I was quilting, but a bit of extra fabric pieced in made it alright and has added to it's imperfect, scrappy nature. Onwards - what's next for the finished pile?